How many times have you arrived home after a long day, only to realise you still have to think of something to make for dinner? Well, what if you lived in a world where this wasn’t a problem, because everything you ate fell from the sky! Imagine if bacon and eggs came down in the morning with a sprinkling of orange juice, or a lovely dinner of roast beef with a spattering of gravy fell in a 6pm shower? How would it be to catch your morning tea of scones with a drizzle of jam and cream? Could you ever become sick of it snowing marshmallows, or raining chocolate milkshake, or hailing gummie bears? It all sounds pretty wonderful right? But what if the ‘weather’ took a turn for the worse? 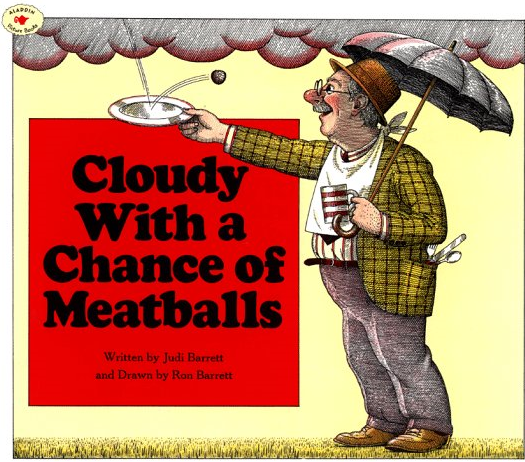 Cloudy with a Chance of Meatballs, by Judi and Ron Barrett, is a classic story about a wonderful and wacky journey into the make-believe town of ‘chew and swallow’. You may have heard of this story a few years ago when it was made into an animated movie. While the townsfolk can’t believe their luck when fabulous things start to fall from the sky, they aren’t quite so thrilled when their houses are squished by giant hamburgers and their streets are piled high with spaghetti and meatballs that came down in an overnight storm! What on earth will they do? Have a silly dinner where everything is giant or miniature, great for learning size words as well as comparative words like ‘bigger’, ‘biggest’, ‘smaller’, ‘smallest’, ‘longer’, ‘longest’, etc. Have a silly dinner where everything is one colour and talk about colours and shades. Make up a silly snack with some unusual combinations of ingredients, maybe a banana and vegemite sandwich? I wonder what that would taste like? Explore cognitive verbs such as ‘think’, ‘know’, ‘imagine’, ‘wonder’, ‘guess’, etc. with your child to help them develop their Theory of Mind skills. Talk about your favourite foods and least favourite foods – does anyone in your family like or dislike the same things as you? Make a chart with everyone’s preferences. Talk about facial expressions, for example how do we know when someone likes something (they smile, they nod their head or their eyes grow brighter) or doesn’t like something (they scrunch up their face, they shake their head or they turn their face away). Do some cooking together and imagine the things you are cooking with are all ‘weather’ things. You could pretend that flour is snow, or that water is rain and sugar is hail! Try writing your ‘weather’ recipe down, or take photos as you cook for an experience book entry! Until next (last!) month, happy reading!